Translator’s Note: Mr Wang Ping (of the ICBI Beijing Office) has forwarded this interesting article for translation into the English language, as a means to spread (and strengthen) knowledge about Chinese Ch’an Buddhism as practised within modern China, in relation to the extraordinary legacy of the Great Ch’an Master Xu Yun. Within the Chinese language, this article is entitled ‘传承虚云精神，弘扬人间禅道’, which can be literally rendered as ‘Transmission of Xu Yun’s Spirit in the Modern Human World’. This article commemorates the 55th anniversary of Xu Yun’s passing in 2014, and describes the gathering of hundreds of people at the Zhen Ru Temple (situated on Mount Yun Ju of Jiangxi province). This gathering also celebrated the life of Xu Yun – emphasising that even within modern China, his example of fortitude and clarity of insight still positively influences people today, indeed, so taken with the ‘feel’ of the Zhen Ru Temple (Xu Yun’s last place on earth), the Chinese author of this article decided to become a lay-disciple. Perhaps of particular interest, is the ‘new’ oil painting of Master Xu Yun – which quite rightly refers to him as a ‘sage’. Although Master Xu Yun was in fact born in the Quanzhou area of Eastern Fujian province, the birthplace of his ancestors was that of the Xiangxiang area of Central Hunan province (a distance of around 563 miles, or 905.6 km). According to Xu Yun’s biography, his family were members of the scholar-official class which followed a tradition of living in Xiangxiang, but pursuing political careers in Fujian province. The example set by Ch’an Buddhist practice is viewed here, as being relevant to modern China, and perhaps the world. The development of modern culture within Mainland China has generated many serious challenges for the traditional modes of behaviour associated with Buddhist culture. The form of Buddhism which is quintessentially ‘native’ to China, is that of the ‘Ch’an lineage’ (禅宗 – Ch’an Zong), which is the product of centuries of contact and integration between incoming ‘Indian’ Buddhism (brought by the enlightened Buddhist monk ‘Damo’ [达摩] who came from the West), and the indigenous Chinese philosophies of Confucianism and Daoism. By the time of the Sixth Ancestor Hui Neng (慧能) – during the 7th-8th CE, Ch’an Buddhism had firmly taken root in China, and eventually developed into the Five Houses and the Seven Lineages. Hui Neng taught the world that every single person possesses the ‘Buddha-nature’, and that through Ch’an training, this spiritual essence can be directly realised, here and now. On the one-hand, Hui Neng simplified the otherwise complex Indian Buddhist teachings, and in so doing, forged a Buddhism that could be called ‘Chinese’ in nature. During the Ming and Qing Dynasties, Ch’an Buddhism lost all its ‘foreign’ aspects, and was fully integrated with Confucianism and Daoism. This development meant that the three religions of China became forever considered ‘amalgamated’ with one another in essence, and particularly within the Qing Dynasty, Ch’an Buddhism was perceived as an ‘official’ method for permanently connecting Daoism with Confucianism. During the latter Qing Dynasty and early Republican era, a number of Buddhist authorities such as Ch’an Master Xu Yun (虚云), Dharma Master Ji Chan (寄禅), the Great Master Tai Xu (太虚), together with many other virtuous Buddhist masters, all stated that they were in favour of developing a ‘humanistic’ system of Buddhist teaching, as a means to assist Buddhism to survive during the dramatically changing times. In many ways, it was Ch’an Master Xu Yun who through his example for over a hundred years, used his practice to benefit the entirety of humanity. In fact, Ch’an Master Xu Yun single-handedly resurrected the Ch’an lineage itself, which had died-out within many of its traditions. Part of this process of breathing new life into the old Ch’an lineage, Ch’an Master Xu Yun actively strove to make Ch’an practice available for all beings. Although strict in his self-discipline, and a staunch advocate for Ch’an students to adhere to the Vinaya Discipline, nevertheless, he made it clear that anyone can ‘clear’ their minds and directly perceive their own inherent (and ‘empty’) Mind Ground. Ch’an Master Xu Yun (1840-1959) was a native of Xiang Township (湘乡 – Xiang Xiang) – situated near Xiang Lake (湘潭 – Xiang Tan), in Hunan province. His lay family name was ‘Xiao’ (俗), whilst his original ordination names were ‘Gu Yan’ (古岩) [Ancient Rock], and ‘De Qing’ (德清) [Virtuous Clarity]. Around 60 years later, he gave himself the name of ‘Xu Yun’ (虚云), or ‘Empty Cloud’. He was a practising Buddhist ascetic for over 100 years, and is responsible for renovating 80 Buddhist temples, 15 Daoist temples, and 6 temples belonging to great Ch’an ancestors, whilst also inheriting all lineages of the Five Houses of Ch’an. He was a founding member of the reconstituted China Buddhist Association (in the early 1950’s), and is considered its first ‘honorary’ president. He is considered to be the greatest modern Chinese Ch’an Buddhist master, and has thousands of disciples, including two very talented adherents that went to become presidents of the China Buddhist Association – the masters in question are named ‘Shi Yi Cheng’ (释一诚), and ‘Shi Chuan Yin’ (释传印) – this is how Ch’an Master Xu Yun influenced Buddhism in modern China far beyond the year of his death in 1959. Ch’an Master Xu Yun is considered to have embodied the tremendous perseverance and will-power associated with the Xiang people – the place of his upbringing. This is seen that throughout his life, he was not afraid of any hardships or obstacles. He also exhibited endless courage, and strictly followed the Dharma for over a hundred years in both the isolation of the mountains, or the noise and activity of populated areas. He practised the Dharma in peace-time and he practised the Dharma during war-time – retaining the same level of commitment throughout. In this manner, he set a firm example for the entirety of humanity, and through his cultivated virtue laid the foundation for the development of humanistic Buddhism. He did all of this and still managed to revive the Ch’an tradition and carried on the teachings of the Indian patriarchs and the six Chinese ancestors into the modern time. This is how Ch’an Master Xu Yun preserved the heritage of Ch’an Buddhism, and spread the teaching of the Sixth Chinese Ch’an Patriarch - Hui Neng. Although strict in his practice, he was not overly conservative in his attitudes. He advocated ‘agricultural Ch’an’ (农禅 – Nong Ch’an), and often taught using a number of different methods. He would advise disciples to train in the countryside, and when the time was right, to train in the village or city. He was flexible and had many thousands of good quality disciples that have subsequently carried Chinese Ch’an Buddhism into the modern era. Today, within the field of isolated Chinese Ch’an Buddhist practice in China, there are three great temples that practice the ‘dense forest’ (丛林 – Cong Lin) tradition, with perhaps the Zhen Ru (真如) Ch’an Temple, situated on Mount Yun Ju (云居), in Jiangxi province, being the most prestigious. This is the birth-place of the ‘Cao Dong’ (曹洞) Ch’an tradition (one of the Five Houses). This is where Ch’an Master Xu Yun spent his last years on earth, and it contains a Ch’an Master Xu Yun Memorial Hall, and a Ch’an Master Memorial Stupa. On October 5th, 2014, a commemoration was held at the temple to remember Ch’an Master Xu Yun’s passing, 55 years previously. Many hundreds of people gathered on Mount Yun Ju to show their respect for the memory of the Venerable Old Master Xu Yun, and to acknowledge his extraordinary enlightened qualities, and how his example and power of spirit, quite literally supported and sustained Chinese Ch’an Buddhism as it progressed into the modern age. Due entirely to the purity of Ch’an Master Xu Yun’s character, Chinese Ch’an Buddhism today, has an excellent quality about it. Buddhist monks of great virtue came from all over China, as did very old mountain monks – to pay their respects to Ch’an Master Xu Yun. They were joined by experts in the practice of Chinese Ch’an Buddhism from both China and abroad, as well as artists inspired by the Ch’an tradition on Mount Yun Ju. The atmosphere was both solemn and respectful throughout the ritual of remembrance. Also present were representatives of Xiangtan city Chinese Culture Research Society – this group has a special section that records the life-events of Ch’an Master Xu Yun, staffed by prominent members of the local community. 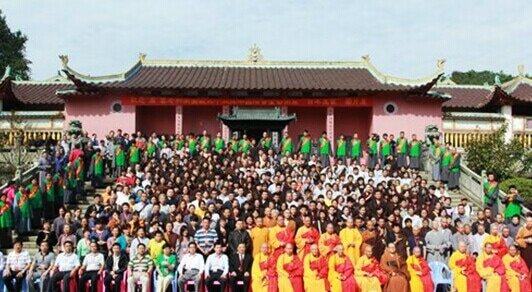 These people are very proud of their historical and communal association with Ch’an Master Xu Yun. Another important local group was the ‘Yun Ju Situated Above the Divine Sky – Ch’an Temple Situated Below the Divine Sky’. This picturesque name refers to the Zhen Ru Ch’an Temple being situated atop Mount Yun Ju – as if above the clouds – whilst its function as a Ch’an temple serves the entirety of humanity spread across the broad earth (under the clouds). The Head Monk (a rank referred to as ‘abbot’ in Western narratives) – Dharma Master Chun Wen (纯闻法师 – Chun Wen Fa Shi) worked tirelessly to promote the autobiography of Ch’an Master Xu Yun, and to encourage authentic Ch’an practice as recorded therein. This event encompassed the concept of ‘Ch’an Dao’ (禅道), or ‘Mind Way’, as a means to explain the presence of Chinese Ch’an Buddhism in the world outside of China – where people from many different cultures (and language groups) apply the meditational teachings in a correct manner that accords with their own culture, whilst not compromising the effectiveness of the technique. Of course, it was mentioned that this is not always an easy task, but it is one that must be pursued nonetheless. It was agreed that nowadays in modern China, Chinese Ch’an Buddhism can no longer be said to just belong exclusively to the Chinese people, but is now a universal teaching open to all interested beings. The Xiangtan city Chinese Culture Research Society emphasised how Ch’an Master Xu Yun often travelled alone, ate one bow of rice a day, and often faced perilous journeys without one word of complaint. He never asked for any help or assistance from others, but always cultivated a great compassion for all beings that he encountered (foreign or Chinese, human or animal), and in so doing truly expressed the essence of the Ch’an Dharma of the Five Houses (that he inherited and rejuvenated). He had no worldly desire and was not interested in status or influence. He was fearless and selfless, and always put the needs of others before his own. He possessed compassion for the common people and never considered himself better than the lay community. He embodied hard-work and spiritual clarity. It is this clarity of spirit of Ch’an Master Xu Yun that the Xiangtan city Chinese Culture Research Society focused upon, suggesting that it is this defining aspect of his character that is still felt in China today, and which imbues the Five Houses of Ch’an. To this end, the Xiangtan city Chinese Culture Research Society founded the ‘Xu Yun Ch’an Culture and Art Research Centre’ as a means to spread Ch’an Master Xu Yun’s influence and example into the outside world. The Deputy Director of the Art Centre - Professor Yang Yongan (杨永安) - has painstakingly studied Ch’an art and culture for many years. 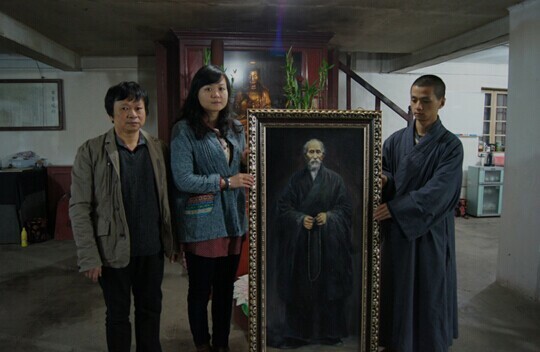 He has had a special admiration for the life of Ch’an Master Xu Yun, and after more than a month of dedicated work, he finally completed an oil painting (in portrait) of Ch’an Master Xu Yun (on November 11th, 2014) – entitled ‘Sage Monk Xu Yun’ (圣僧虚云 – Sheng Seng Xu Yun). On that very same day, the Xiangtan Institute of Public Good escorted this important portrait from Xiangxiang to the Guan Yin Pavilion (观音阁 – Guan Yin Ge) situated on Mount Yun Ju – for viewing and worship. The portrait was then escorted East of Xiangxiang to Mount Tai in search of the ancestral source. From November 15th and 16th, 2014, the Xiangtan city Chinese Culture Research Society Consultant Zhu Peili (朱培立), Executive Vice President Yang Bin (杨斌), Xu Yun Ch’an Art and Cultural Research Centre Director Liu Luxi (柳璐溪), Deputy Director Yang Yongan (杨永安), and Deputy Secretary-General Zuo Yong (左勇) and his group, all escorted this sagely portrait to Mount Yun Ju in Jiangxi province, where it was placed in the Zhen Ru Ch’an Temple for continuous veneration. This was the 5th pilgrimage this year, before the painting was eventually placed in its permanent home of the Xu Yun Memorial Hall. This sagely portrait is an excellent example of the blending of Ch’an meditation and Ch’an artistic endeavour. This portrait represents the immortal respect with which Ch’an Master Xu Yun is remembered today. The Head Monk – Dharma Master Chun Wen – respectfully received this portrait of Ch’an Master Xu Yun on behalf of the Zhen Ru Temple, from the scholarly representatives of the Xiangtan city Chinese Culture Research Society, and after assessing the art-work, confirmed the accuracy and spiritual quality of the creation, stating that this group had a profound insight and understanding of the Ch’an method and appreciation of the life of Ch’an Master Xu Yun. As a consequence, the sagely portrait of Ch’an Master Xu Yun was grandly welcomed and formally accepted at the temple. The painting has received continuous praise (as has its artist from Xu Yun’s hometown), and is a valuable addition to the Zhen Ru Temple’s project of being developed into an ‘International’ Chinese Ch’an learning centre. The point of this activity is to understand Ch’an Master Xu Yun’s life, how he taught and preserved Ch’an, and how farming and Ch’an practice are intimately linked. This integrated understanding of the Ch’an method is then extended to include all applicable art forms, so that Chinese Ch’an culture can be made relevant for use and appreciation by the outside world. This was a mission of goodwill between the lay community and the Zhen Ru Temple, with Vice President of Xiang city Chinese Cultural Research Society (and Director of the Xu Yun Ch’an Cultural Research centre) Ms Liu Luxi observing that within the Zhen Ru Temple, the monks are quiet, respectful, simple and strictly follow the Vinaya Discipline. Liu Luxi further stated that under the wise leadership of the Head Monk – Dharma Master Chun Wen – the Ch’an meditation practice in the hall was exact and precise, and that the agricultural Ch’an practised in the farming fields around the temple, was carried-out with a calm and joyful mind. Ms Liu Luxi was so impressed with the spirit of ‘Ch’an Dao’ at the temple, that she requested to be accepted as a disciple. With a warm heart, the Head Monk Chun Wen granted the request and a compassionate ceremony of admittance was arranged. After the completion of the ceremony, Liu Luxi was given the Dharma-name of ‘He Lu’ (合璐), and confirmed as being accepted into the ‘Linji’ (临济) lineage of Ch’an, before being registered at the Zhen Ru Temple. This saying, although uttered by Ch’an Master Xu Yun, actually describes exactly how Xu Yun behaved himself, and why today in modern China, he is still remembered with such heartfelt admiration and respect. We believe that with the prosperity of modern China, the ancient tradition of Chinese Ch’an Buddhism can and does have a very important place. This is because Ch’an practice sets a good example of cultivating virtue and generating good behaviour amongst the people. This creates the conditions for a peaceful and harmonious society where people can pursue their respective livelihoods without fear or hindrance. It is inevitable that the Ch’an culture of Xu Yun will revitalise the ecology of China, and hopefully the world, by demonstrating how a spiritual practice can be pursued just as effectively within the farmers field, as it can be within the Meditation Hall.